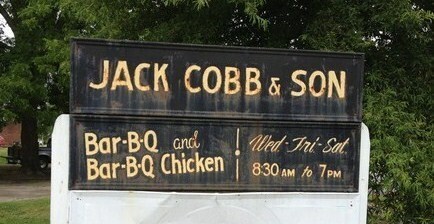 The Barbecue Bros’ quest: to visit each restaurant on the North Carolina Historic Barbecue Trail by the end of 2013 2014 2015 2016 2017 2018 2019. We will track our progress on this page, linking to reviews of each place we visit. 12. Hill’s Lexington BBQ, Winston-Salem – 11/24/17 new! Speedy: I thought the ‘cue was really, really good. The portion was pretty big (probably enough for two meals), the pork and (red!) slaw were great, and it was just a great meal. Monk: The chopped pork was tender, had nice pieces of bark mixed in, and had good smokiness. The sauce was a bit sweeter than I’d have preferred (or have had from a Piedmont-style barbecue spot) but for the most part I had no real complaints. My husband is trying to find a BBQ place that smokes their meat in the center of the restaurant, like The Salt Lick in Texas. Have you found any in NC? Hi Rae Ann – both Old Hickory House in Charlotte and Hillbilly’s BBQ & Steaks in Gastonia/Lowell have their pits inside the restaurant. Curious of readers know of others. What happen to Wilson & Rocky Mount best in the state. I suspect they may not be represented because a lot of the joints in those parts don’t cook over wood anymore. Any particular favorites of yours, Nora? You guys ever tried Mr. Barbecue in Winston-Salem? Pretty decent Lexington style (duh!) with nice red slaw. Must be doing something right to be there for fifty years, basically unchanged. I (Monk) personally have not but will put it on the list. Thanks, Ron! and closes when they sell out. Get to Skylight. No excuses! Love the site. Great job, guys. I know, I know…thanks for the kind words. Where in the Charlotte area can I take whole Turkey, Chicken and Fish to have it smoked or barbecued on consignment? It doesn’t have to be rated a 4 or 5 star barbecue place. Just some truck mounted or regular mom and pop barbecue restaurant would do. i am not picky.